tellofilms, the "HBO of lesbian content", is proud to present "#Hashtag", a new web series about the online lives and loves of a pair of lesbian twenty-somethings. We can't believe that Liv and Skylar, who've been living in our heads for so long, will be alive and kicking on tello in less than a month! "We can't believe that Liv and Skylar, who've been living in our heads for so long, will be alive and kicking on tello in less than a month!" said Bergh, a stand-up comedian who also appeared in the tello series "Roomies" with Julie Goldman & Brandy Howard. Zak adds: "To have a production company support us through script development, production, and release is a dream for a beginning writer, and we're proud to have our show up on tello along with their fun, funny, and poignant lesbian stories." #Hashtag follows Skylar (Bergh) who's struggling with the ill-effects of her long-term relationship on her comedy career, and her best friend Liv (Zak), whose Instagram obsession is interfering with her OkCupid goals. The series guest stars "Cowgirl Up" favorite Marnie Alton, Kate Black Spence (from tello's "The Throwaways"), Jim Bennett, Amy Thompson, and many other amazing Chicago talent. 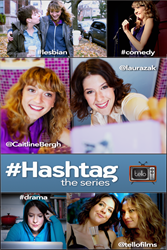 Starting Sunday, March 16th, new episodes of "#Hashtag" will be released every Sunday, exclusively on lesbian web series hub tellofilms.com. tello makes and distributes web series for, by and about lesbians. Learn more about tello, and get your subscription here.